Much has been said about the likelihood of China overtaking the US to become the world’s largest economy in the next decade or so, as this chart shows. 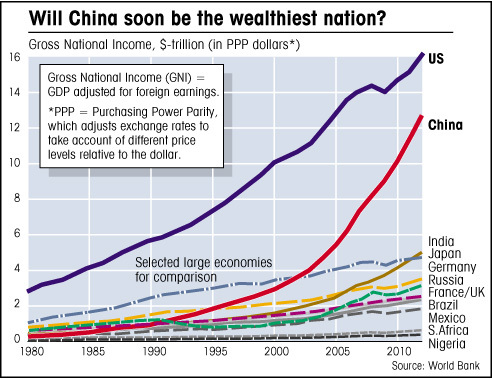 But although China might become the world’s biggest economy in terms of industrial output, it is highly unlikely that nations such as China and India will ever approach the levels of wealth seen in the US and Europe. Ignoring the fact that an increase in consumption on such a massive scale – the two nations account for 2.5 billion people, compared to 800 million for the US and Europe combined – would surely be disastrous for the environment, the economic growth required to boost individual wealth to such levels cannot be sustained for more than a few years without the economy overheating. China’s rapid growth is already slowing down, as wages and productivity rise along with prices, and demand eases off both within China and throughout the world. 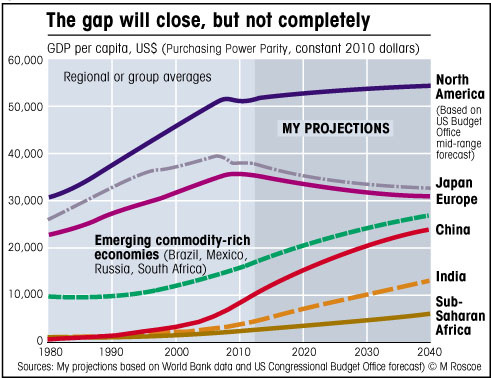 It seems far more likely, and far more desirable from an ecological viewpoint, that the developing nations will gradually close the gap on the rich world through a combination of continuing moderate growth on their part, accompanied by a decline in overall wealth levels in much of the rich world. In the following chart I have plotted, with a little help from the US Congressional Budget Office, what I think is a likely scenario for this adjustment in relative wealth. While it seems inevitable that Europe and Japan will see a permanent decline in wealth, the prospects for the Americas generally, and North America in particular, seem less bleak. This is due mainly to the ratio of natural resources to the number of people. There has always been a direct relationship between natural resources and wealth, but whereas in the past Europe grew rich by plundering the natural wealth of colonized lands, these days it has to pay the going rate for the raw materials of industry, most of which it must import, and this rate is bound to keep rising as resources become scarcer. So it follows that those bigger nations with abundant natural wealth and not too many people will most likely benefit, as we have already seen to varying degrees in Canada, Australia, Brazil and Russia. The US has two big advantages over Europe. As well as having a much greater abundance of land and mineral wealth, it also has demographic advantages related to a younger population, and both of these factors will give it greater flexibility when it comes to budget balances and debt repayment. 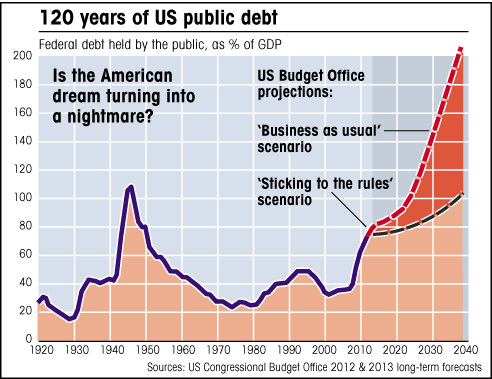 There is a big question mark here, however, because the US debt burden could get a lot worse over coming decades, depending on what action the government takes. My next chart comes from a 2012 report by the US Congressional Budget Office, which analyzes the long-term outlook and comes to some rather startling conclusions. This is quite a dramatic admission from a government office, one that is also applicable to some European nations, though they are less inclined to state the issue so clearly. The report is making the point, quite simply, that the west is going to get poorer. Without going so deeply into the fundamentals, the authors are confirming many of the points I’ve been making in this book; we have been borrowing substantially from future earnings, and one way or another we’ll have to repay those loans. So the US is faced with currently unsustainable social-welfare obligations; it can’t meet future pension and healthcare promises. Much of Europe is in the same position. These promises will be broken. The US, however, has better prospects for solving this problem, partly because its economy could still show spurts of growth, helped by new oil and natural gas reserves made possible by its development of ‘fracking’ technology, as explained in Chapter 17. 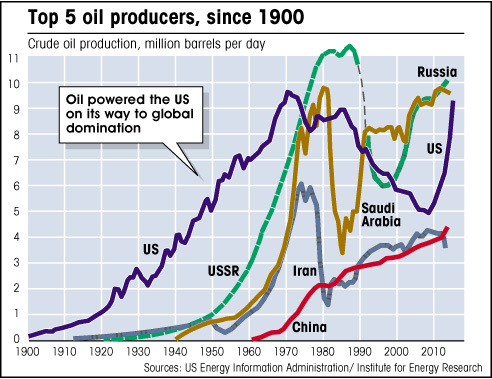 The US is back in the top league of oil producers, and as I make clear elsewhere in the book, oil is the biggest source of wealth in this world. The resulting cheap natural gas is already attracting businesses from other nations, as the US becomes once again a competitive place to make things. China will lose its cost advantages as wages rise; the balance is likely to swing back in America’s favour, especially if US wages continue to fall in real terms. Despite environmental concerns, fracking is the only real boom industry on the horizon right now, and the US will most likely be the biggest beneficiary, thanks to its technological lead in the field. From an ecological viewpoint this might not be good news, but as far as the US economy goes, it probably is. It is also significant, with regard to America’s continuing role as the only real superpower, that the US dollar and the English language have become the de-facto international standards, a situation that has both resulted from, and also helped to sustain, that US business and cultural dominance. In other words, such global supremacy has a self-perpetuating tendency, making it difficult for other nations to challenge, as Europe discovered when it launched the euro, partly in the hope of reducing the influence of the US dollar. It hasn’t happened. This dominance of the dollar, although in some respects it helps the one nation that can print what is effectively the global currency, is not good for the world, which feels compelled to put much of its savings into US dollars, even though the ability of the US to service its debts is declining. I suggested earlier [in the book] that a process of excessive credit creation over the last two decades or so has resulted in the inflation of the money supply relative to the real process of wealth creation in the underlying economy, so that money is now overvalued by around a third in relation to the real wealth of industry, meaning that commodities are currently undervalued. As with many aspects of economics, this is difficult to prove, but it is generally accepted that our monetary system is far from perfect, and is one of the primary causes of the present crisis. Global imbalances in currency reserves, such as the one between China and the US (in which the US effectively owes China over one trillion dollars, as explained in Chapter 12) constitute a major threat to global stability. One problem is that the value of US dollar reserves held globally as assets, being roughly equivalent to the total annual output of the US economy, far exceeds America’s ability to meet those obligations. Further devaluation of the dollar, which is very likely under these circumstances, and the subsequent reduction in the value of all dollar holdings, could lead to a rapid switch out of dollar assets and a subsequent rise in interest rates (because the risk of US default will rise). This in turn could lead to a global financial crisis far greater than the one in 2007–8, potentially wiping out a third of the world’s supposed wealth, as the dollar, and all money generally, falls to its true value when measured against genuine economic wealth, as I have attempted to demonstrate in previous chapters. So the situation whereby one nation issues the de-facto global currency, in this case the US dollar, is not good for the stability of the global economy. National priorities don’t necessarily coincide with international priorities. In addition to this point, and linked to it, there has been a rapid expansion of the world’s financial markets since the demise of the Bretton Woods gold standard, based on the creation of excess credit through the unchecked leveraging of accumulated wealth. The combination of these two related developments has resulted in unproductive debt creation, excessive currency speculation and volatile capital flows, leading in turn to recurring financial crises, as we have seen. The only solution to this value-of-money problem is to restore the link between money and the underlying wealth-creation of the real economy. Does this mean a return to the gold standard? I would suggest not, for the reasons cited by Keynes. Better to introduce a global currency tied in some way to the global output of genuine industry; similar in principle to the gold standard, but more generally representative of overall wealth creation rather than being linked to the value of one particular commodity. In theory, this ought to be quite straightforward. The global currency would be issued by a global central bank, created perhaps by combining and reforming existing institutions such as the IMF, World Bank and/or the Bank for International Settlements, and would circulate in parallel with national currencies, replacing the dominant role of the US dollar. The global currency would be a stable measure of value linked to real industrial production, rather than to sovereign credit creation.